Will Woody Allen’s Next Film Be Shot in Coney Island? The return of the nervous kid who grew up in a house under a roller coaster? Woody Allen says his next movie will be set in an amusement park and could possibly be shot in Coney Island this summer. “If I can work out the logistics of it,” he told reporters at the Cannes Film Festival. Scenes from Allen’s 1977 Annie Hall were filmed in Coney at the since demolished Thunderbolt roller coaster and the Cavalcade Bumper Cars on Surf Avenue. Where would he film today? Well, there’s Luna Park’s new Thunderbolt roller coaster, which does not have a house under it but does have a hair-raising 90 degree drop, and the roller coaster like thrill of the Wonder Wheel’s swinging cars, and the mighty Cyclone. The house under the roller coaster in Annie Hall was the real life home for 40 years of Mae Timpano, who shares vivid memories of good times and sad in a 2005 documentary by Lila Place. “If the wind was blowing towards the house, I heard everything going on in Coney Island,” says Timpano in the film. On Sunday we happened to be on the Boardwalk in Coney Island at the very moment the lights on the Parachute Jump were switched on. Known as Brooklyn’s Eiffel Tower, the Jump is being lit in France’s tricolor to show solidarity after the Paris attacks. 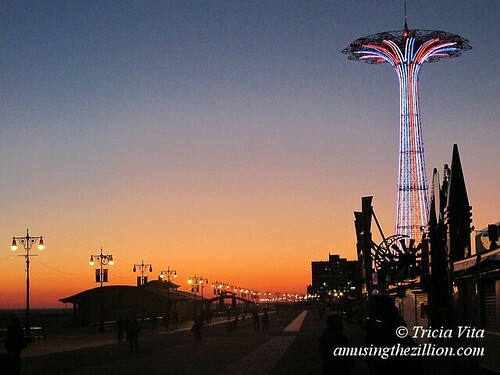 Although Coney’s rides are now closed for the season, the Parachute Jump’s 8000 LEDs are lit year round with lighting schemes varying by the day. occasion and season. One of our favorite shots of the Jump is through the loop of Luna Park’s Thunderbolt roller coaster, which is on West 15th Street off the Boardwalk. This 16-minute documentary by Mike Edwards and newly posted on YouTube was made in 1977 to celebrate the Cyclone’s 50th anniversary. It’s fantastic to see the roller coaster in action in the ’70s. The opening sequence features Silvio Pinto, whose family bought and began operating the roller coaster in 1959 before selling it to the City a decade later. The film also stars famed riders Mike Boodley, who rode the Cyclone for 1001 consecutive rides, and Richard Rodriguez, who holds the Guinness World Record for riding the coaster continuously for four days. At the time the film was made, Edwards was a college student in Staten Island. His film was nominated for his school’s “Oscars” and toured NYC Parks with the Parks Foundation’s Filmobile. As a boy born and raised on three of the 5 boroughs of NYC from 1951 to 1979, a summertime trip to Coney Island was always in the mix. I remember the day while confined to Steeplechase Park, (the grandest kiddie amusement park ever! ), when my gaze became transfixed on the world class wooden roller coasters that thundered and squealed off in the distance. I couldn’t wait for the day when I was old enough and big enough to ride these coasters. I measured myself by first getting comfortable riding the Thunderbolt and then the Tornado roller coasters before I felt ready for the Cyclone. Fast forward to 1977 when I chose the Cyclone to be the subject of a documentary film exercise while attending the very fine Richmond College, an experimental humanities school in the CUNY system, where I was to receive a BA in Cinema Studies. With either a wind-up Bolex 16 or a Bell & Howell Filmo 16mm camera and a 100’ spool of reversal film, I went to visit my subject while under a blanket of snow. Like coming upon a hibernating beast, I kept my distance shooting wide shots without a footprint. Aided by the calm of this early Sunday morning, I could feel a life-force at rest, knowing what was expected of it and what was to unfold in the early spring months. Right there on Surf Avenue, I knew my documentary project would be to explore and maybe expose that this mechanical, inanimate object is actually a being with a distinct personality. 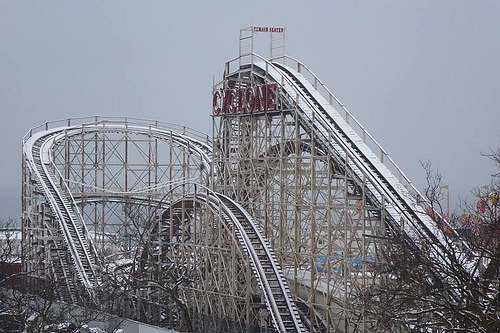 In this striking photo of Saturday morning’s snowfall by Coney Island resident Bruce Handy, the Cyclone is transformed into veritable “Russian Mountains,” as the world’s first roller coasters were called. 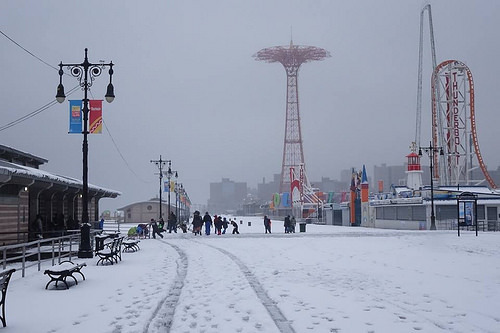 The Beach and Boardwalk are a Winter Wonderland. It was a perfect day for Brooklyn’s Boy Scouts and Cub Scouts, who brought their homemade sleds to Coney Island for the annual Klondike Derby. More snow is predicted for Monday and Tuesday. Summer officially begins on Saturday, June 21st, with the solstice and Coney Island’s Mermaid Parade. This past Saturday offered a taste of summer: the long-awaited debut of Luna Park’s Thunderbolt roller coaster, Wonder Wheel Park’s Pet Costume Contest on the Boardwalk, and the Brooklyn Cyclones season opener followed by the first fireworks of the season. The Cyclones stadium is spectacularly situated with the landmark Parachute Jump on one side and the new Thunderbolt on the other. Last evening at 6:55pm, Zamperla’s Thunderbolt roller coaster went for its first test run, evoking cheers from fans gathered on the Boardwalk. Coney Island photographer Bruce Handy had been standing by for the historic moment and captured “The Thunderbolt’s Maiden Voyage” in this short video. As previously noted (“High Hopes for Coney Island’s New Thunderbolt Coaster,” ATZ, March 10, 2014), Coney Island has been home to dozens of roller coasters since the Switchback Railway debuted in 1884 but it’s been a long 87 years since one was custom built for Coney — the Cyclone in 1927. Luna Park’s newest ride is named in honor of the 1925 Thunderbolt and is expected to open as soon as the test runs and permitting process are complete. To anyone who watched this video of the Thunderbolt’s first test run and jumped to the conclusion it would open over the weekend, hang in there! 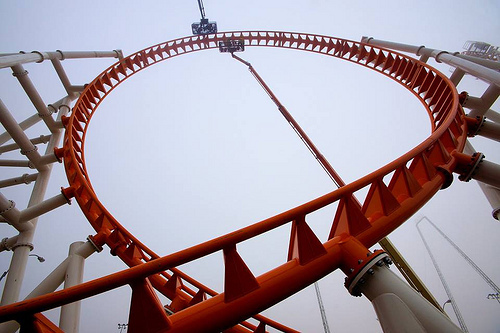 There’ll be multiple test runs, some of which were conducted today, before the new coaster opens. On Saturday, Luna Park employees variously said the coaster would open next Saturday or in two weeks, but there’s been no officially announced date. Weekend visitors to Coney Island were wowed by the sight of Zamperla’s Thunderbolt roller coaster under construction on West 15th Street. 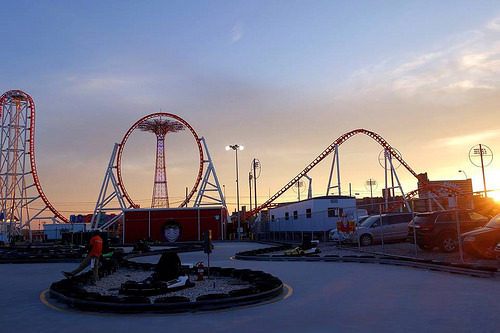 Set to open on Memorial Day, which is just one week away, the new $10 million dollar ride’s track rolls, loops, turns and dives from the Boardwalk to Surf Avenue and back again. Photographer Jim McDonnell, who has been documenting the work in progress since Day 1, has captured the sculptural elegance of the coaster. 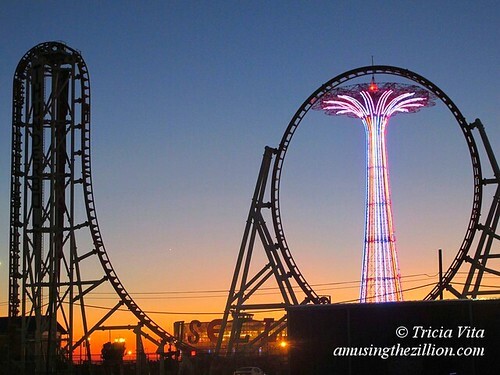 The Thunderbolt has already made its mark on Coney Island’s skyline. Seen from a certain vantage point, the landmark Parachute Jump–Brooklyn’s Eiffel Tower– is framed by the Loop in a shot that is destined to become a favorite of People’s Playground photographers and a Coney classic. 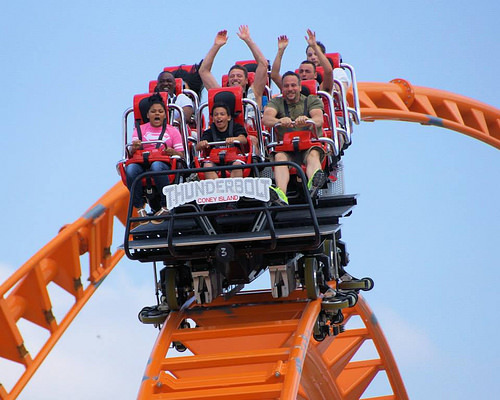 On Thursday, the Thunderbolt’s 100-foot Loop was completed. 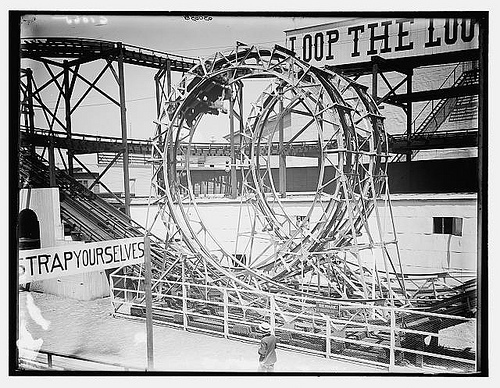 It was a stunning moment because it’s the first coaster with a vertical loop in Coney Island since the 1901-1910 Loop the Loop, which stood on the corner of West 10th Street where the Cyclone is today. Edwin Prescott’s ride was one of the first to charge admission just to watch. 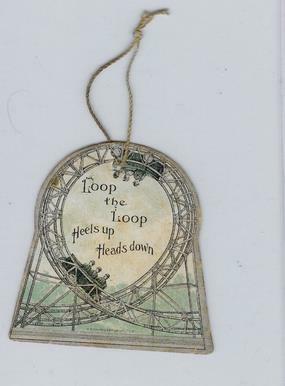 A sign warned “Beware of Pickpockets!” and another said “STRAP YOURSELVES.” The ride’s motto, printed on its tickets, was “Heels up, Heads down!” But the Loop the Loop’s low capacity of four passengers per 10 cent ride was not enough to turn a profit. The Thunderbolt will cost $10 or 10 Luna Park credits to ride. If you’re not brave enough to give it a go, it will of course be free to watch. As previously noted (“High Hopes for Coney Island’s New Thunderbolt Coaster,” ATZ, March 10, 2014), Coney Island has been home to dozens of roller coasters since the Switchback Railway debuted in 1884 but it’s been a long 87 years since one was custom built for Coney — the Cyclone in 1927. The new ride is named in honor of the 1925 Thunderbolt, which occupied an adjacent lot on the same block until it was controversially and illegally demolished in 2000 on the orders of Mayor Giuliani. The Thunderbolt is the third Zamperla coaster in Luna Park to be named after Coney Island attractions of the past. In 2010, their Wild Mouse-style spinning coaster was rechristened “The Tickler” in honor of an innovative 1906 thrill ride in the original Luna Park, after which the park is named. The next year, a Pony Express-themed Motocoaster in Scream Zone was dubbed the Steeplechase Coaster, after Steeplechase Park’s signature horse race ride. Watch this video from last evening, when the Thunderbolt went for its 1st first test run.